Food Network(s sni) junkies now have a digital outlet for the pangs of hunger the network’s popular TV shows induce. FN is launching its own restaurant finder and recommendation app for the iPhone and iPad(s aapl). Called On the Road, the app shares many features with popular foodie apps Yelp, Urbanspoon, Nosh, and Forkly, but it’s fundamentally a different animal. Rather than crowdsource information, reviews and photos, all of the content in the On the Road is drawn from the Food Networks own TV and magazine programming. That may seem like a limiting factor, but the Food Network has a lot of programming. A search for restaurants near my north side Chicago home yielded 23 businesses within a two-mile radius – ranging from upscale establishments, diners, bakeries, and hotdog and burger joints. While the app can be used to simply find a random place to eat, most of the features are built around FN’s programming. Separate sections are included for each of FN’s TV shows, and you can search by chef as well — many of FN’s personalities bridge multiple TV show. So if you like the show “Diners, Drive-Ins and Dives” you can bookmark the restaurants Guy Fieri features on the show or you can recommend them to friends through built-in Twitter, Facebook(s fb) and email buttons. If you really like “Diners, Drive-Ins and Dives” you can use one of the app’s key features to generate a “road trip” highlighting every one of the taquerias, greasy spoons and fried chicken joints appearing on the show in a particular metro area or region. Food Network is trying to tap into peculiar emerging phenomenon: the foodie road trip. It’s included several pre-defined road trips with the app, either centered on particular cities like New York or San Francisco or on regional cuisine, such as Texas BBQ. But the app also allows you to easily generate your own tailored road trips and has a built in badge-based reward system for customers who complete those treks. It’s a slickly designed app, but it’s definitely not for everybody. If you love the Food Network, then you’re going to love On the Road. But anyone looking for a more general-purpose restaurant recommendation app might be disappointed. There’s very little information about the individual restaurants beyond location data, a brief description, and a URL; and all establishments are treated equally – there are no stars or reviews. But that’s the point. In an interview earlier this year, Food Network GM of digital Bob Madden told me that FN’s digital and mobile content strategies are built entirely around the concept of supporting its more traditional TV and magazine programming. Ultimately FN’s chefs are the curators of On the Road’s content and do they do their curating on TV. The app is intended to provide an interactive complement to that programming. There are exceptions to that strategy though. 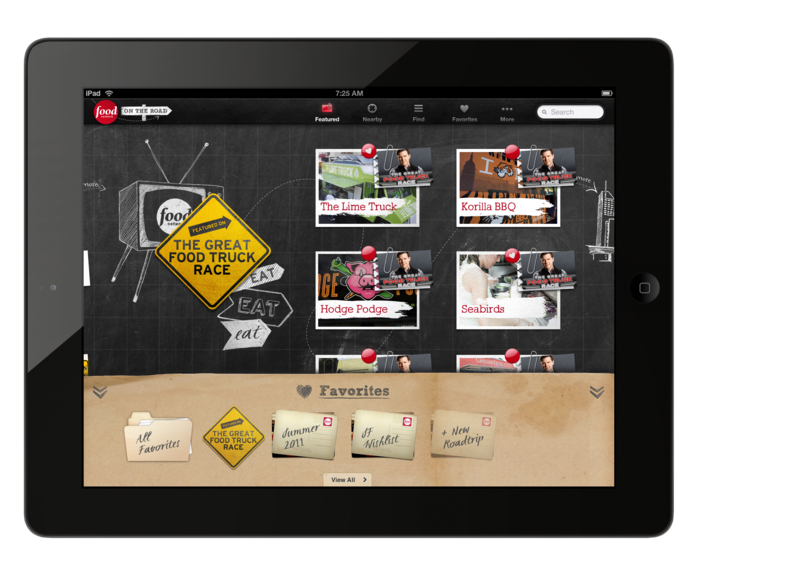 In April, FN launches an interactive cupcake cookbook for the iPad that contained content unique to the app.